Twice baked potatoes are by far one of my favorite foods. I honestly think I could eat them every single night for dinner, and never get tired of them. Chubbier, yes. Burned out, no. With the weather turning cooler, I have been all about comfort food, and found myself craving their carby, cheesy goodness. And while it's tempting to use the excuse that "I'm eating for three," I try to reign it in and abide by the moderation rule (besides this weekend. I think I ate about 25 cupcakes. More on that later though). 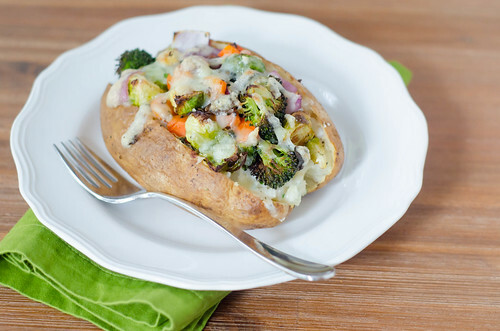 These twice-baked potatoes stuffed with roasted vegetables were a perfect compromise. The potatoes are rubbed with olive oil, salt, and pepper, and baked like normal. For the last 15 or 20 minutes, I threw in some chopped veggies to get those tender and caramelized. I then scooped out the filling of the potatoes, and mashed it with some Greek yogurt, herbs, and Gruyere cheese. I stuffed the filling back in and topped the potatoes with the roasted veggies and a little more Gruyere. After a brief stint in the oven, they emerged as a healthier, hearty version of my beloved twice baked potatoes. Feel free to play around with the vegetables and use any combination that you like. I used onions, broccoli, brussels sprouts, and carrots. All vegetables that I knew Caroline and Smith would eat, and the combo worked really well together in my opinion. Also feel free to use any combo of herbs. I believe I used rosemary, sage, thyme, and parsley. Just use whatever you have on hand and sounds good. These were a big hit with Caroline and Joey. Smith loved the carrots and brussels sprouts, but he's not the biggest fan of broccoli yet, unfortunately. I served these as the main course with some apple and pear slices, but if you need something more substantial, they'd be great as a side dish to any array of proteins - steaks, roasted chicken, pork loin... really anything. And you can feel good knowing that you're getting a healthier version of the steakhouse favorite. 3-4 cups bite-sized chopped vegetables, for roasting (I used carrots, broccoli, brussels sprouts, and onions. Just be sure they are all about the same size so they cook evenly). Preheat the oven to 425 degrees. Rub the potatoes with olive oil and season with salt and pepper. Use a fork to poke a few holes in the top of each one, then place on a baking sheet. Bake until cooked through, about an hour (it all depends on the size of your potatoes though - start checking them after 45 minutes). Toss the vegetables with olive oil, salt, and pepper and arrange in a single layer on a rimmed baking sheet. Transfer to the oven and cook on the shelf below the potatoes until the veggies are browned and crisp-tender, about 15-20 minutes, stirring halfway through. Remove the potatoes and the vegetables from the oven and allow the potatoes to cool until they are cool enough to handle, about 20 minutes or so. Slice the potatoes open, and scoop out as much of the filling as you can, being careful not to tear the skin. Add the filling to a medium bowl and mash with the Greek yogurt and milk until mostly smooth, but a few chunks still remain. Stir in the garlic powder, 3/4 cup of the Gruyere cheese, and the herbs. Season to taste with salt and pepper, and return the filling to the potatoes. Divide the roasted vegetables among the potatoes, and sprinkle with the remaining 1/4 cup of Gruyere cheese. Return to the oven and bake 15-20 minutes, until the cheese has melted and the filling is heated through. Serve. I tend to avoid baked potatoes because I always feel like they're so nutritionally devoid...but these are rockstars!! This looks so good! I love potatoes but it always takes sooo long to bake them. Thanks anyways, I'll definitely try this one! Absolutely putting these on next week's menu! These stuffed potatoes sound amazing! I haven't baked a potato in so long--good thing it's fall now, right? I also really like the idea of using yogurt in the potato mash. Yay! This is a great idea! Great for work lunches! oh my goodness, how have I not thought of this before? I'm immediately trying this with a sweet potato because they're one of my favorite foods on the planet! Thanks so much for the recipe? I never tried baked potatoes before. I know, weird huh? I love this twist on a twice-baked potato! I have been looking for "stuffed" food recipes lately, and this is perfect.